Tea for real booklovers. This set of 5 contains all five tea flavors! (Midsummer Nights' Dream, Sense & Sensibilitea, Once Upon a Time, Fairytale Forest en Beautea & the Beast). A tea blend straight from your favorite fairytale: discover Beautea & the Beast, fresh and fruity. With apricot, maracuja and sunflower blossom! A tea blend straight from the fairytale forest! This tea is flowery sweet, perfect tea to drink while reading a good book. 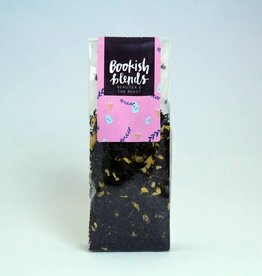 A s black and green tea with rose petals, osmanthus blossom, sunflower blossom and cornflower blossom!